Nothing wakes me up faster than the simple, declarative sentence, “We’re going to Mammoth Lakes.” I don’t think about the scary patches of single-lane 395 Highway out of Adelanto to Ridgecrest that I absolutely hate while riding on the shoulder to avoid the huge semi’s and trailers coming directly at me separated by only a faint dotted line. Rather, I fantasize about the jagged mountain peaks, cerulean skies, alpine lakes, fresh pine air and deep dish apple pie high in the heavens. After stretching our legs and refueling in Ridgecrest (I’m not sure what that town is doing there, other than the fact that a Naval Weapons Center is stationed at nearby China Lake), Colleen and I took dead aim on Mammoth, driving past Lone Pine, looking out the window only long enough to see if we could spy the great Mt. Whitney, zipping through Independence and Big Pine until reaching Bishop Calif. From Bishop, it’s only another 40 miles up the hill to Mammoth Lakes. While there are many fine places to hole up in Mammoth, ranging from the budget-priced Holiday Haus, whose sign out front reads, “Cheap and Cheerful,” ($50 to $110 in summer) to the Westin Monache ($250 to $400 a night, as best I could tell), we elected to stay at the Shiloh Inn. It was affordable and familiar, and years ago I knew the manager at the Shiloh Inn in Pomona and grew fond of the place. But it’s not a luxe resort by any means, and it’s not really charming. It was just a place to bed down for the night before hitting the great outdoors. 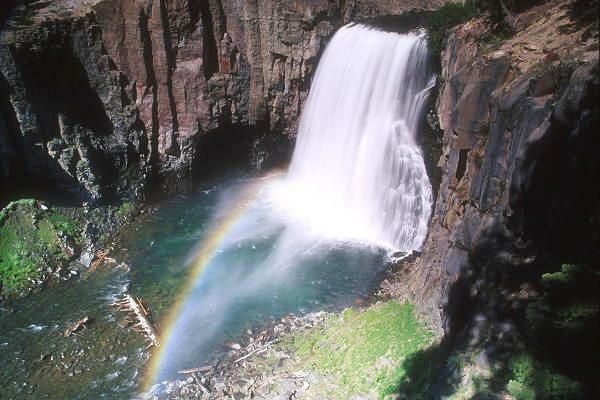 My favorite Mammoth Lakes outing is hopping on the tram down to Red’s Meadow, and then hiking down 1.5 easy miles to Rainbow Falls. It’s never disappointed. How could it be? The roar of the falls and the refreshing mists are hypnotizing. Pack a picnic lunch or pick up some grub at the Red’s Meadow coffee shop before undertaking your descent. Of course, what goes down, must go up! Once we were back to civilization — the Village at Mammoth — we got back in our car to trek over to Twin Lakes and the Tamarac Lodge. Open since the 1920s, the Tamarac (www.tamarac.com) offers a variety of accommodations from rustic studios with wood-burning stoves and showers to fancy two-bedroom/two-bath suites with fireplaces. The last expensive rooms are in the main lodge. The Tamarac’s Lakefront Restaurant features a seasonally changing menu, with irresistible entrees like grilled medallions of elk filet and seared sea scallops. Across the foot bridge at Twin Lakes, Colleen and I were also fortunate to watch a loving couple exchange their vows in the Forest Chapel. The pews are hewn out of forest logs and rustic timber. We don’t recommend playfully skipping from pew to pew as a few kids and even a few older, but not wiser, adults tried. One innocent was dumped as if he had been thrown from his skateboard. On Sunday, we were guilty of trying to squeeze in a week’s full of activities into a day. We got up early to eat at The Stove, foolishly thinking we’d be among the first in line. The secret has been out about this place for three decades, so we still had to happily endure a half-hour wait before settling down to the Stove special of two eggs with ham, bacon or sausage and banana nut pancakes. Coll opted for the French toast, which she liberally shared with me. Newly fortified, we set out for the Hot Creek Geologic Site near the Mammoth Yosemite Airport (take the Hot Creek Hatchery Road and follow the signs). At the end of a washboard road, we stopped at a paved parking lot and hiked along a path until we reached the creek, boiling and belching with steam. Because a few people literally have been cooked to death here and because it became an unregulated beer fest on weekends, the popular sunning and soaking area has been fenced off – a piece of Eastern Sierra history no more. With the sulfur still wreaking havoc with our naval cavities, we got back in the car and returned to U.S. 395 and headed south to search for Wild Willy’s, a watering hole that hasn’t yet been cordoned off. At Benton Crossing Road, just south of the Airport, (the little green church on the corner is a good landmark) we traveled east about 2.5 miles until crossing two cattle guards. After the second, we turned right and followed the road, always taking the left fork whenever we had a choice. About a mile down the road, we reached a parking area where there’s a sign and wooden boardwalk that leads about 200 yards away to the pools. Because we were sort of on the clock we never made it to nearby Hillside, which is another hot water hot spot, affording fabulous views of Lake Crowley and the Owens Valley. Next time. Next time. We reconnected to Hwy. 395 once again until we reached the Rock Creek turnoff, which is about halfway between Mammoth and Bishop. As you push up the hill to the 10,000-foot high Rock Creek Resort, you start to wish if you were back in one of the valley’s hot tubs. Your reward instead is Little Lakes Valley, a quilt of beautiful alpine lakes so serene and magisterial you could die here with a smile on your face. Pushing out from the Mosquito Flats trailhead, we said we’d walk for an hour before turning back. We just had the weekend and we were on sort of on the East Sierra sampler diet, filling our lungs with enough fresh air, sights and memories to renew us and drink deep into our souls until our next visit. There was another reason for turning back. The Rock Creek Resort is also the home of the Pie in the Sky Café, where at 10,000 feet, you can feast on an assortment of pies. Here’s our final tip. Before you set out on your hike, buy a pie or two first, because when you get back after a vigorous hike, there may not be any pies left. That’s how crazy popular this place is. We swear that when we turned our backs the lodge pole pines turned into people and ate everything in sight, from the Dutch apple, boysenberry, fresh strawberry and fresh nectarine to the mud, cheddar pear, lemon cream and pecan chocolate chip. We got our slices, but we cut it close, and would have been unhappy campers all the way home, had we been shut out. When the pie is gone, it’s gone, and when the weekend is over, it’s over. It’s back down the hill to L.A. and La Verne. With the juices of the fresh nectarine and peach pies still kissing our lips, we didn’t even bother to stop at Schat’s bakery in downtown Bishop – a sacrilege, I know. That was a first. Next time. Mammoth Lakes will always keep you coming back for more! Share with us your favorite vacation memories!